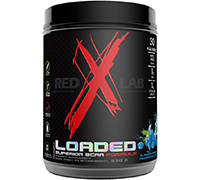 Loaded is a superior BCAA formula for intra-workout supplementation. Loaded incorporates the muscle recuperation properties of BCAAs and the muscle building properties of EAAs with the performance enhancing ability of Citrulline Malate! Branched Chain Amino Acids help improve exercise efficiency and capacity. 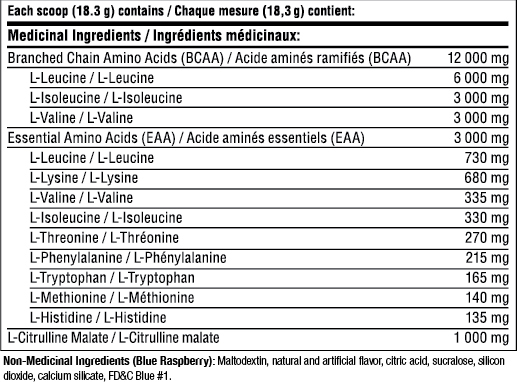 Each scoop of Loaded contains 12 grams of instantized BCAAs (2:1:1) to help the muscle recovery process and reduce muscle tissue damage during physical activity. Where all 9 Essential Amino Acids are present, they help retain, stimulate and build muscle. Each scoop of Loaded is formulated with 3 grams of a combination of all 9 EAAs to help increase your basal metabolic rate to burn more calories throughout the day. Citrulline is one of the three main amino acids of the urea cycle that improves the ammonia recycling process. When taken as a supplement, it results in increased endurance for both aerobic and anaerobic extended workouts. How to use Loaded: Mix 1/2 scoop (9.15 g) in 6 oz of water immediately before consumption. Drink during your workout or any physical activity.